Saturday morning I finished off the second sleeve on my Mountain High sweater, blocked and let it air dry for a bit and then popped it in the dryer for 20 minutes on super low. That’s one of the great things about this Lion Brand Heartland yarn. It’s machine washable and dryer friendly since it’s a 75% acrylic to 25% wool blend. I actually like that it’s not overwhelming hot like a lot of my 100% wool sweaters tend to get. 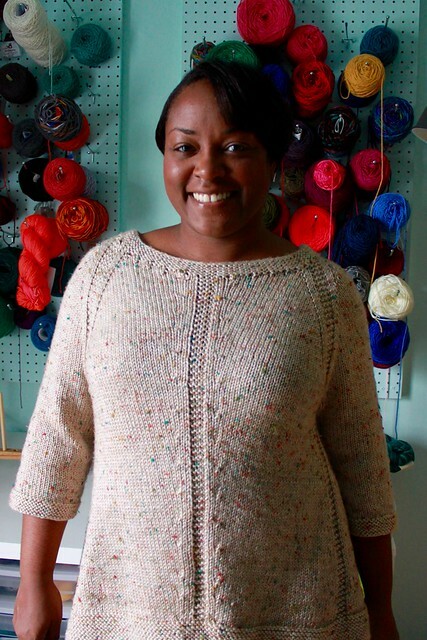 Plus the drape of this sweater turned out just lovely. 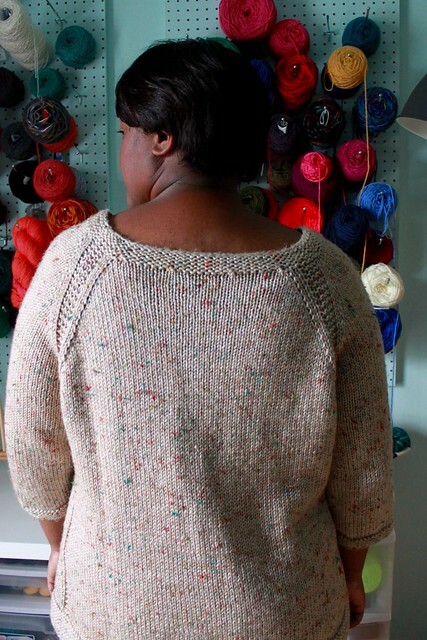 I used the Acadia Tweed color, a soft cream with bits of rainbow colored thread throughout, but I could totally see myself knitting this sweater again or a basic raglan in a lot of the other colors they have with this yarn. I’m not a yarn snob, I will work with acrylics, wool, cotton, bamboo. I’ll give any fiber a try at least once! Plus I’ve got 2 skeins of it left so I think I’ll whip up a hat to go with my fall jacket. When I saw this pattern I was interested in making it because I wanted to make a basic sweater in a neutral that I could wear all the time. I wanted something that was basic but didn’t look basic and the garter stitch detail down the center and sides turned a basic sweater into something special. Plus I love how it pulls away from the hips and has a soft swing to it. Since I’m only 5 ft 4 inches I ended the body repeats early and only did a 2 inch garter stitch border instead of 3 inches. I didn’t want this to turn into a dress on me. I also did a 3/4 length sleeve because I love showing off my crazy Swatch watches and bracelets. I’m so, so very happy about this piece. 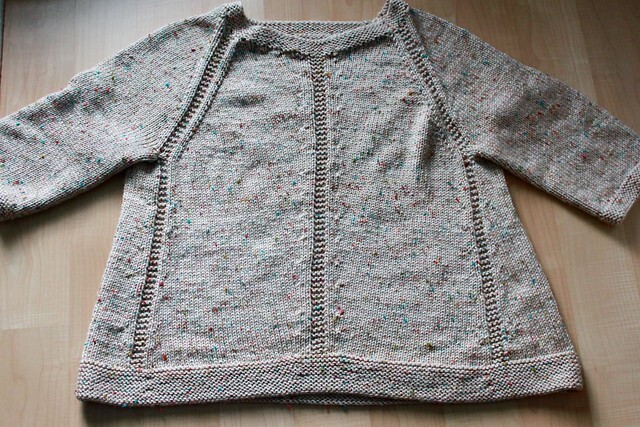 I really do want to knit it again in a different color because I fear this might be the only thing I wear on weekends. And I’m even wearing it to work today with a pencil skirt and some burnt orange tights to pick up the flecks in the sweater. It’s a super easy, top down construction and the garter stitch gives it just enough detail to make it special. I highly recommend getting this pattern on Ravelry. It is definitely one of my favorites. I would wear that in a heart beat! Looks awesome. It’s going to be a staple in my wardrobe. Absolutely love it. I want to make another one already. Thanks and yes, I will share the kitchen! This has taken a lot out of me! I painted this weekend. Simply Beautiful! You make me wanna try this pattern so bad! I really recommend it. It’s top down, raglan shaping with garter stitch to make the detail. Super simple and it’s worsted weight! Do it! I really like the yarn! The drape is great too. This looks great! You make me want to make one, too. I just need to figure out a decent yarn (I never have worsted to hand!). Worsted is what I have an abundance of! It’s why I finish projects so quickly. I love the chic simplicity and you look great in it!!! I’m just starting to learn by knitting a scarf, but you’ve inspired me to try and tackle this sweater next! It’s all about learning new things. And if you need visuals, try Very Pink Knits on YouTube. She does great tutorials. 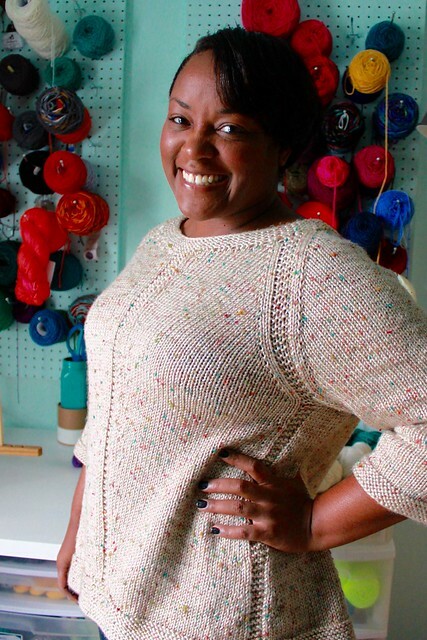 Saw your sweater on ravelry homepage– beautiful! Looks great on you, and I love this design. Thanks to your comments about the project, I’m going to give it a whirl. Have a wonderful day!